Order custom Imprinted Sliding Mint Tins – a tasty and convenient way to get your brand or logo, team or school, business and more to customers! 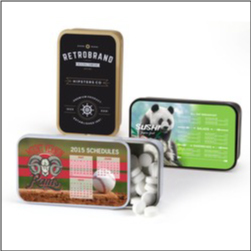 Mints can be sugar free and tin includes digital printing. The top slides away for access to the fun mints or candy fill items (many candy fills available). Great for school boosters and fundraising by printing a schedule of games etc. right on the lid. A perfect low-cost giveaway item for many industries. Order your custom sliding mint and candy tins today! 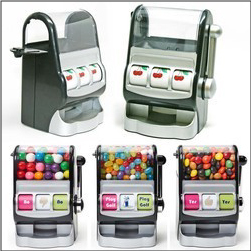 Order Custom Jackpot Slot Machine Candy Dispensers – these fun and unique promo items make great gifts or prizes, etc. The amusement machines come with your choice of candy / nuts etc: chocolate, peppermint, gumballs, lemon drops, mints, jolly ranchers, skittles, M&M’s, trailmix, red hots, gummy bears, sour balls, Swedish fish, hard candy, chocolate raisins, boston baked beans, malt balls, rainbow twists, sweet tarts, assorted bon bons, money coins, cashews, almonds, peanuts, pistachios, mixed nuts. 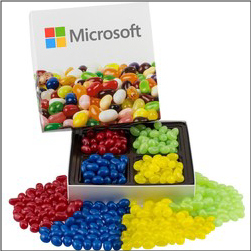 Order Custom Colored Jelly Beans in imprinted Boxes – match these to your business logo, school colors, and more. These jelly beans come in a 4 way insert and are perfect for matching to your logo or team colors, etc. Often ordered as corporate food gifts and special thank you gifts for customers and clientele. Made in USA. Popular with booster fundraising. 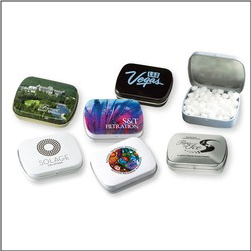 Order printed Custom Tins of Mints – the perfect promotional item for nearly any event, business, school fundraiser, etc. Mints are Made in USA and a non-melt product. Keepsake tin is recyclable and a fun way to get your logo to your customers, potential clients, to promote your school clubs and to use as booster fundraising and more. 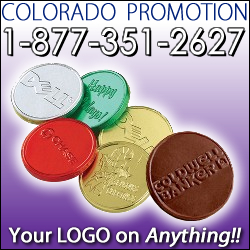 Order your custom Mint Tins today from Colorado Promotion! Great Custom Promotional Ad Marketing Items since 1995. 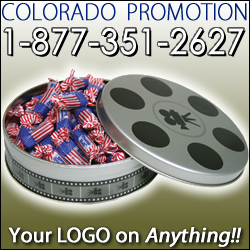 Movie Themed Reel Tins available empty, filled with candy, nuts, etc. Great giveaway items for film festivals, movie premiers and parties, opening night handouts, etc. Filling include: chocolate, peppermint, gumballs, lemon drops, mints, jolly ranchers, skittles, M&M’s, trailmix, red hots, gummy bears, sour balls, Swedish fish, hard candy, chocolate raisins, boston baked beans, malt balls, rainbow twists, sweet tarts, assorted bon bons, money coins, cashews, almonds, peanuts, pistachios, mixed nuts, etc.